Posted on 02/27/2011, 21:19, by martin, under General, R, Soccer, Sports. I feel ashamed for this boring title, but hope that the entry can make up for it. 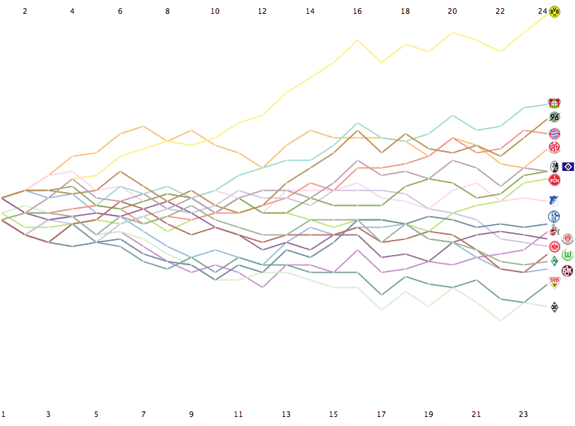 This visualization did inspire me, as a comment did point to my Tour de France visualizations. Although I didn’t use readHTMLTable before, it was a 15 min. job to get the script fixed – a definite recommendation for jobs like this! 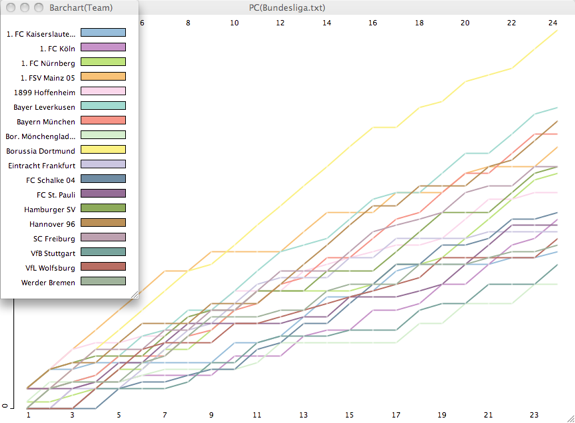 But now to the visualizations: Let’s start with the simple trajectories of the points of each team. Easy to see that the gap to BVB remains at the same level for more than 10 games now, and for roughly five games, the direct opponents are somehow not to get rid off. Here is the text file, you might use to play around yourself using Mondrian – which was used to create the visualizations. how did you insert the logos of each club into the graphic? 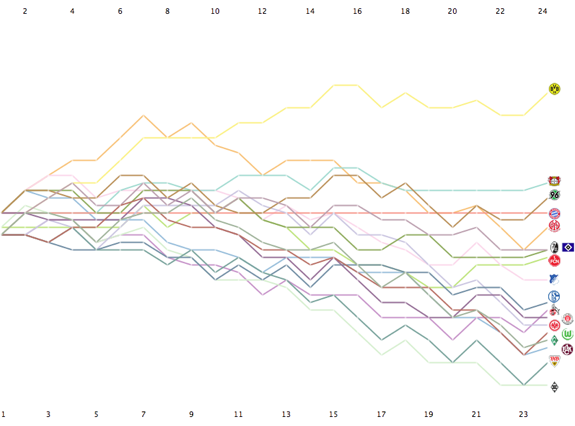 was that done with R or Mondrian? It was neither Mondrian nor R. I used Apple’s Keynote as the placement was quite tricky. Disclosure: The reddit comment (which didn’t get too much love) was mine (as the club crest next to my nick sort of gives away).